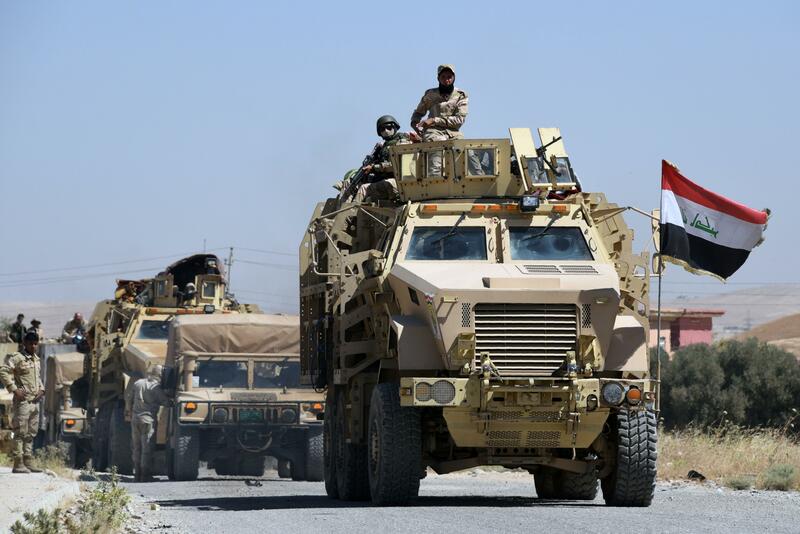 BAGHDAD -- U.S.-backed Iraqi security forces on Sunday began a multi-pronged military operation to retake the town of Tal Afar, west of Mosul, from the Islamic State of Iraq and Syria (ISIS), Iraq's prime minister announced. Tal Afar and the surrounding area is one of the last pockets of ISIS-held territory in Iraq after victory was declared in July in Mosul, the country's second-largest city. The town, about 150 kilometers -- 93 miles -- east of the Syrian border, sits along a major road that was once a key IS supply route. "The city of Tal Afar will be liberated and will join all the liberated cities," Prime Minister Haider al-Abadi said in a televised speech to the nation broadcast on state television early Sunday. He was dressed in a black uniform of the type worn by Iraqi special forces. Al-Abadi said his message to ISIS was: "You either surrender or die." By early afternoon, Lt. Gen. Abdul-Amir Rasheed Yar Allah, who commands the operation, said the forces had recaptured five villages east of town. In a statement, the U.S.-led coalition praised Iraqi security forces as a "capable, formidable, and increasingly professional force and they are well prepared to deliver another defeat" to ISIS in Tal Afar like in Mosul. "Mosul was a decisive victory for the Iraqi Security Forces, but it did not mark the end of (ISIS) in Iraq, or its worldwide threat," said U.S. Army Lt. Gen. Stephen Townsend, the commander of U.S. and Coalition forces in Iraq and Syria. The Coalition estimates that approximately 10,000-50,000 civilians remain in and around Tal Afar. Along with Tal Afar, IS militants are still fully in control of the town of Hawija west of Kirkuk, as well as the towns of Qaim, Rawa and Ana in western Iraq near the Syrian border. Tal Afar has been a stronghold for extremists in Iraq since the 2003 U.S.-led invasion that toppled Saddam Hussein. Many senior leaders al-Qaida in Iraq and ISIS were from Tal Afar. Iraq's mostly Shiite militiamen largely stayed out of the operation to retake Mosul, a mostly Sunni city about 80 kilometers -- 50 miles -- to the east, but have vowed to play a bigger role in the battle for Tal Afar, which was home to both Sunni and Shiite Turkmen before it fell to ISIS, a Sunni extremist group. The militias captured Tal Afar's airport, on the outskirts of the town, last year. Their participation in the coming offensive could heighten sectarian and regional tensions. The town's ethnic Turkmen community maintained close ties to neighboring Turkey. Turkish officials have expressed concern that once territory is liberated from ISIS, Iraqi Kurdish or Shiite forces may push out Sunni Arabs or ethnic Turkmen. A stepped up campaign of airstrikes and a troop buildup has already forced tens of thousands to flee Tal Afar, threatening to compound a humanitarian crisis sparked by the Mosul operation. Some 49,000 people have fled the Tal Afar district since April, according to the United Nations. Nearly a million people remain displaced by the nine-month campaign to retake Mosul.